Speaker Bio: Stephen Frech has earned degrees from Northwestern University, Washington University in St. Louis, and the University of Cincinnati. He has published three volumes of poetry: Toward Evening and the Day Far Spent (Kent State University Press) won the 1995 Wick Poetry Chapbook Contest, If Not For These Wrinkles of Darkness won the White Pine Press Poetry Prize, published in 2001, and The Dark Villages of Childhood won the 2008 Mississippi Valley Poetry Chapbook Prize. He has a chapbook of mixed genre work, A Palace of Strangers is No City, published by Cervena Barva Press in 2011. In 2012, he published a translation of poetry from the Dutch: Menno Wigman’s Zwart als kaviaar/Black as Caviar. He has been the recipient of the Elliston Poetry Writing Fellowship, the Milton Center Post-Graduate Writing Fellowship, and grants from the Ludwig Vogelstein Foundation and the Illinois Arts Council. 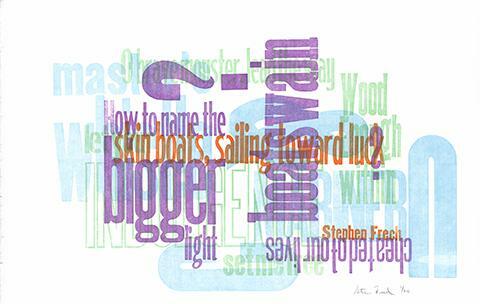 Stephen Frech founded Oneiros Press in 2000 to showcase some of the finest poets in America in letterpress broadsides. Shawn Sheehy, a graphic designer and book artist living in Chicago, is designer for the press. Each year, Oneiros Press prints a poet of national reputation in the fall who then serves as final judge for the open poetry contest. Poems of the judge and the winner of the contest appear in 150 signed and numbered editions. Featured poets include Albert Goldbarth, Jane Mead, Lawrence Ferlinghetti, and Ai. Oneiros Press broadsides capitalize on the full range of visual elements – color and image – as another channel into the heart of poems. As the visual and literary elements are fully integrated in the broadsides, each is individually designed, a specific showcase for the specific poem. The design and craft of Shawn Sheehy have resulted in Oneiros Press broadsides finding their way into notable special collections around the world, among them the University of Amsterdam, the Beinecke Collection at Yale, the John M. Wing Collection at the Newberry Library in Chicago, and the Brauer Museum of Art at Valparaiso. Oneiros Press broadsides were featured in the prestigious Print Magazine Regional Design Annual in 2002, a high honor that Sheehy has received in other years for his design work. Stephen Frech is Associate Professor of English at Millikin University.